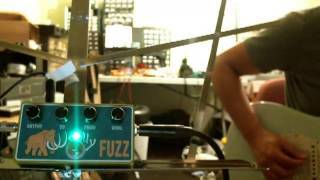 Huge Fuzz for Bass and Guitar. 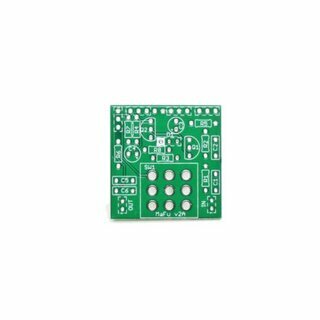 Great pcb, fast and simple to construct. The pedal has a lot of bass and gain, a small mod with a PreGain could make it more controllable on guitar, beautiful on bass! Good ! 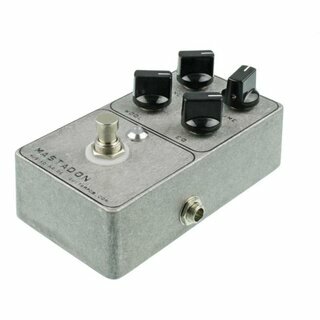 Mastadon Fuzz kit 5 from 5 Good ! 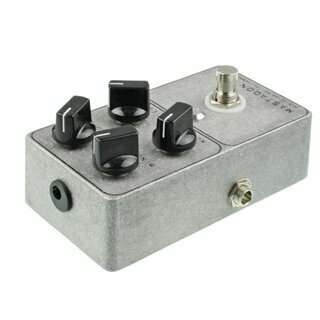 Easy to build, and works great with bass. Not difficult to build and sounds great (at least on bass). But hey, I get noise from EQ pot! Sizzling. I am reasonably experienced in building electronic circuits. The distance between switch and LED seems off, compared to the holes in the metal case. Which means you have to bend the LED wires quite a bit, and it is possible, I think, that you are unlucky and the outer leads of the LED just touch the metal tube which holds the LED on the front panel, shorting it. Also, I had to remove a plastic plug in that pipe to get the LED through, as the holes in that plug do not match the LEDs leg alignment. One of the electrolytic capacitors has to be bent so it wont block the way for the switch when mounting the PCB - bad if you soldered it tight and then notice ;) And it still somewhat touches the tip of an inserted plug, being so close to the TRS jack. Not perfect design. 1) Potentiometers: look at the PDF schematic. 2..3 of the 4 pots, if I recall correctly, short the wiper connector with one of the end connectors. This means you need to solder only 2 wires instead 3 for those pots - one end shorting the two pins on the pot, the other end going into one of the 2 PCB holes for that pot which are shorted on-PCB anyway. 2) Soldering wires to the PCB while it is mounted in the case. Then you can solder the wire into the hole - and because it is tinned and stiff, and all is contained within a sturdy enclosure, neighboring wires are at no risk to get shorted even though 1..2 mm of non-insulated wire will stick out of the board in parallel. Just make sure that there is no stuck-through wire end touching a metal part of e.g. a TRS jack where it gets close to the PCB. If there is such a spot on the PCB, you could cut 3/4 of the tinned wire end and solder it to the mounting hole on the board without, or barely sticking it in. Nice kit and easy to build but i think the pinch pot has no use, always at full clockwise to obtain a very nice huge and powerful fuzz sound.